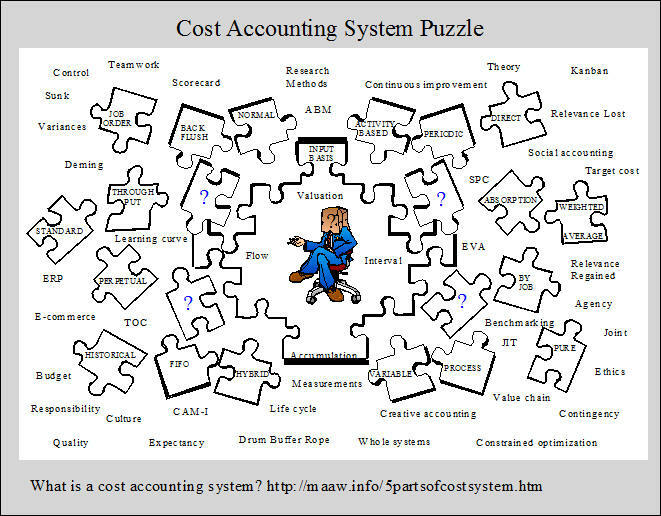 What is a Cost Accounting System? Inventory valuation methods and cost accumulation methods are frequently referred to as cost accounting systems in the accounting literature. However, these methods are only parts of a system or subsystems. The purpose of this section is to explain how the various methods, subsystems, or parts fit together to form a cost accounting system. 5. a capability of recording inventory cost flows at certain intervals. These five parts and the alternatives under each part are summarized in Exhibit 2-1. Note that many possible cost accounting systems can be designed from the various combinations of the available alternatives, although not all of the alternatives are compatible. Selecting one part from each category provides a basis for developing an operational definition of a specific cost accounting system. The basis of a cost accounting system begins with the type of costs that flow into and through the inventory accounts. There are three alternatives including: pure historical costing, normal historical costing and standard costing. These concepts are illustrated in Exhibit 2-2 and discussed individually below. In a pure historical cost system, only historical costs flow through the inventory accounts. Historical costs refers to the costs that have been recorded. The term actual costs is sometimes used instead, but the term "actual" seems to imply that there is one true cost associated with a particular output. But determining the cost of a product, or service requires many cost allocations, e.g., allocating the cost of fixed assets to time periods, and allocating indirect manufacturing costs, or overhead to products. Since there are many alternative allocation methods, (e.g., straight line or accelerated depreciation) the calculated cost of a unit of product or service simply represents an attempt to approximate the true cost. A pure historical cost system is symbolized in the top left section of Exhibit 2-2. Normal historical costing uses historical costs for direct material and direct labor, but overhead is charged, or applied to the inventory using a predetermined overhead rate per activity measure. Typical activity measures include direct labor hours, or direct labor costs. The amount of factory overhead charged to the inventory is determined by multiplying the predetermined rate by the actual quantity of the activity measure. The difference between the applied overhead costs and the actual overhead costs represents an overhead variance. The concept is represented in the top right section of Exhibit 2-2. This type of cost system is illustrated in Chapter 4and Chapter 5. Predetermined overhead rates and overhead variance analysis are discussed in those and subsequent chapters. In a standard cost system, all manufacturing costs are applied, or charged to the inventory using standard or predetermined prices, and quantities. The differences between the applied costs and the actual costs are charged to variance accounts as shown symbolically in the lower section of Exhibit 2-2. The variances provide the basis for the concept of accounting control, which is somewhat different from the statistical control concept discussed in Chapter 1. This type of basic cost system is illustrated in Chapter 9 and Chapter 10. Standard cost variance analysis is given considerable attention in Chapter 10. The four inventory valuation methods that appear in Exhibit 2-1 are arranged in the order of the amount of cost that is traced to the inventory. The throughput method involves tracing the least amount of cost to the inventory, while the activity based method includes tracing the greatest amount of costs to the inventory. In direct (or variable) costing, a greater amount of cost is traced than in the throughput method, but a lesser amount than in the full absorption method. Direct costing and full absorption costing are the traditional methods, while the throughput and activity based methods are relatively new. These inventory valuation methods are very important because they control the manner in which net income is determined. As we shall see is this chapter and subsequent chapters, the amount of net income can vary tremendously for different inventory valuation methods. The four methods are described below. The throughput method was developed to complement a concept referred to as the theory of constraints. In this method only direct material costs are charged to the inventory. All other costs are expensed during the period. The concept is symbolized in the top left section of Exhibit 2-3. Sales, less direct material costs is referred to as throughput which reflects how the method got its’ name. The throughput method does not provide proper matching (as defined by GAAP) because all manufacturing cost, other than direct material are expensed when incurred rather than capitalized in the inventory. Therefore, the throughput method is not acceptable for external reporting although advocates argue that it provides many advantages for internal reporting. The throughput method is described in more detail in Chapter 8 along with the broader concept referred to as the theory of constraints. In the direct (or variable) method, only the variable manufacturing costs are capitalized, or charged to the inventory. Fixed manufacturing costs flow into expense in the period incurred as illustrated in the top right section of Exhibit 2-3. This method provides some advantages and some disadvantages for internal reporting, (as we shall see in Chapter 8, Chapter 11, and Chapter 13). However, it does not provide proper matching because the current fixed costs associated with producing the inventory are charged to expense regardless of whether or not the output is sold during the period. For this reason direct costing is not generally acceptable for external reporting. Full absorption costing (also referred to as full costing and absorption costing) is a traditional method where all manufacturing costs are capitalized in the inventory, i.e., charged to the inventory and become assets. This means that these costs do not become expenses until the inventory is sold. In this way, matching is more closely approximated. All selling and administrative costs are charged to expense however, as indicated in the lower left section of Exhibit 2-3. Technically, full absorption costing is required for external reporting, although many companies apparently use something less than a pure full absorption costing system. The full absorption method is also frequently used for internal reporting. The second major section of this chapter compares the income statements for full absorption costing with those used for direct costing because they are by far the dominant methods. Chapter 4, Chapter 5, Chapter 6, Chapter 9 and Chapter 10 are based on full absorption costing. Chapters 8 compares all four methods and includes a discussion of the behavioral implications of using the different methods. Activity based costing is a relatively new type of procedure that can be used as an inventory valuation method. The technique was developed to provide more accurate product costs. This improved accuracy is accomplished by tracing costs to products through activities. In other words, costs are traced to activities (activity costing) and then these costs are traced, in a second stage, to the products that use the activities. The concept of ABC is illustrated in the lower right section of Exhibit 2-3. Another way to express the idea is to say that activities consume resources and products consume activities. Essentially, an attempt is made to treat all costs as variable, recognizing that all costs vary with something, whether it is production volume or some non-production volume related phenomenon. Both manufacturing costs and selling and administrative costs are traced to products in an ABC system. Note that treating selling and administrative costs in this way is not acceptable for external reporting. In traditional full absorption costing and direct (or variable) costing systems, indirect manufacturing costs are allocated to products on the basis of a production volume related measurement such as direct labor hours. Thus, the fundamental differences between traditional systems and activity based systems are: 1) how the indirect costs are assigned (ABC uses both production volume and non-production volume related bases) and 2) which costs are assigned to products (in ABC systems, an attempt is made to assign all costs to products including engineering, marketing, distribution and administrative costs, although some facility related costs may not be assigned). At the present time, most of the companies that use the activity based method have developed stand alone, micro-computer based systems separate from the company's mainframe cost accounting system used for external reporting.4 The idea is to develop more accurate product costs than the traditional cost accounting system provides so that management can make better strategic decisions such as product introduction, pricing, mix and discontinuance. In these systems, ABC is not used as an inventory valuation method. Activity based costs are not charged to the inventory accounts. However, it is used to determine product costs once per year, or more frequently when changes are made in the production process. The activity based method is described in Chapter 7 and referred to frequently in other parts of the text. Cost accumulation refers to the manner in which costs are collected and identified with specific customers, jobs, batches, orders, departments and processes. The center of attention for cost accumulation can be individual customers, batches of products that may involve several customers, the products produced within individual segments during a period, or the products produced by the entire plant during a period. The company’s cost accumulation method, or methods are influenced by the type of production operation (See the Product-Process Matrix below and the Hayes & Wheelwright summaries for more information), and the extent to which detailed cost accounting information is needed by management. The four accumulation methods that appear in Exhibit 2-1 are discussed below. In job order costing, costs are accumulated by jobs, orders, contracts, or lots. The key is that the work is done to the customer's specifications. As a result, each job tends to be different. For example, job order costing is used for construction projects, government contracts, shipbuilding, automobile repair, job printing, textbooks, toys, wood furniture, office machines, caskets, machine tools, and luggage. Accumulating the cost of professional services (e.g., lawyers, doctors and CPA's) also fall into this category. Chapter 4 illustrates a cost accounting system that includes normal historical costing as the basic cost system, full absorption costing as the inventory valuation method and job order costing as the cost accumulation method. In process costing, costs are accumulated by departments, operations, or processes. The work performed on each unit is standardized, or uniform where a continuous mass production or assembly operation is involved. For example, process costing is used by companies that produce appliances, alcoholic beverages, tires, sugar, breakfast cereals, leather, paint, coal, textiles, lumber, candy, coke, plastics, rubber, cigarettes, shoes, typewriters, cement, gasoline, steel, baby foods, flour, glass, men's suits, pharmaceuticals and automobiles. Process costing is also used in meat packing and for public utility services such as water, gas and electricity. Chapter 5 illustrates a cost accounting system that includes normal historical costing as the basic cost system, full absorption costing as the inventory valuation method and process costing as the cost accumulation method. Back flush costing is a simplified cost accumulation method that is sometimes used by companies that adopt just-in-time (JIT) production systems. However, JIT is not just a technique, or collection of techniques. Just-in-time is a very broad philosophy, that emphasizes simplification and continuously reducing waste in all areas of business activity. JIT systems were developed in Japan and depend on the communitarian concepts of teamwork and continuous improvement. In fact, many of the assumptions, attitudes and practices of communitarian capitalism are included in the JIT philosophy. One of the many goals of JIT systems is zero ending inventory. In a backflush cost system, manufacturing costs are accumulated in fewer inventory accounts than when using the job order or process cost methods. In fact, in extreme backflush systems, most of the accounting records are eliminated. The production facilities are also arranged in self contained manufacturing cells that are dedicated to the production of a single, or similar products. In this way more of the manufacturing costs become direct product costs and fewer cost allocations are necessary. Thus, more accurate costing is obtained in spite of the fact that the cost accumulation method is simplified. The just-in-time philosophy and related accounting methods are discussed in Chapter 8. Hybrid or mixed systems are used in situations where more than one cost accumulation method is required. For example, in some cases process costing is used for direct materials and job order costing is used for conversion costs, (i.e., direct labor and factory overhead). In other cases, job order costing might be used for direct materials, and process costing for conversion costs. The different departments or operations within a company might require different cost accumulation methods. For this reason, hybrid or mixed cost accumulation methods are sometime referred to as operational costing methods. A cost flow assumption refers to how costs flow through the inventory accounts, not the flow of work or products on a production line. This distinction is important because the flow of costs is not always the same as the flow of work. The various types of cost flow assumptions include: specific identification (e.g., by job), first in, first out, last in, first out and weighted average. Costs flow through the inventory accounts by the job in a job order cost system which represents an example of specific identification. The requirements of the various jobs determines the timing of the cost flows. Simple jobs tend to move through the system faster than more complex jobs. The first-in, first-out (FIFO) and weighted average cost flow assumptions are used in process costing. Since costs are accumulated by the process or department in a process cost environment, a cost flow assumption is needed to determine the treatment of the beginning inventory. When FIFO is used, it is assumed that the units of product in the beginning inventory are finished first and transferred to the next department before any of the units that are started during the period. The group of units in the beginning inventory maintain their separate identity and prior period costs. However, when the weighted average cost flow assumption is used, the beginning inventory units lose their separate identity because they are lumped together with the units of product started during the period. Process costing tends to be fairly challenging, therefore you may find these introductory concepts to be confusing. Don’t worry, these concepts will be easier to understand when we consider an operational process cost accumulation system in Chapter 5. Although last-in, first-out (LIFO) is frequently used for tax reporting purposes, it is not normally used in the accounting records. For this reason, we consider the FIFO and weighted average cost flow assumptions in Chapter 5, but leave the LIFO cost flow assumption for courses that emphasize financial and tax reporting. Inventory records can be maintained on a perpetual or a periodic basis. Conceptually, the perpetual inventory method provides a company with the capability of maintaining continuous records of the quantities of inventory and the costs flowing through the inventory accounts. The periodic method, on the other hand, requires counting the quantity of inventory before inventory records can be updated. In the past, manufacturers tended to keep perpetual inventories, while retailers used the periodic method. However, today a variety of modern point of sale devices and dedicated microcomputer software are readily available to provide any company with perpetual inventory capability.